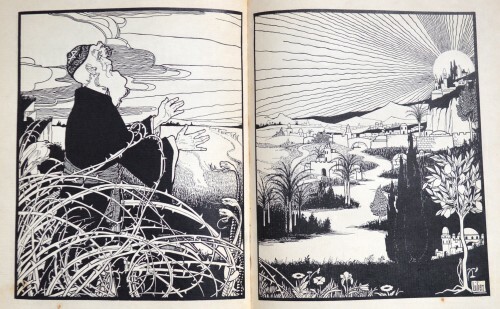 The illustrator E.M. Lilien fused Zionist iconography with Art Nouveau style in this volume of German translations of Yiddish poems by Morris Rosenfeld. Theodor Herzl’s 1896 publication, Der Judenstaat (The Jewish State), was by no means the first to call for the establishment of a Jewish state. 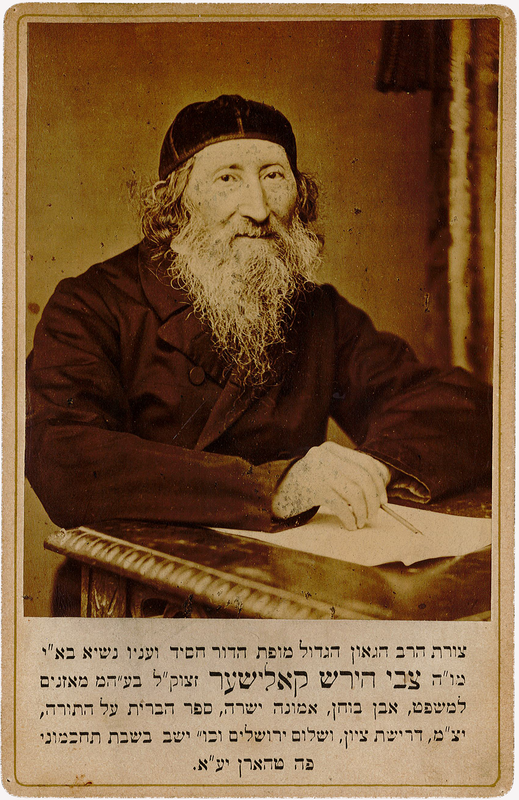 Three decades earlier, two Jewish philosophers from opposing sides of the ideological spectrum formulated their own ideas for Jewish statehood: Rabbi Zvi Hirsch Kalischer, an Orthodox rabbi from Thorn in Prussia (Torun, Poland)—often referred to as the first Zionist—and Moses Hess, a Socialist and associate of Ferdinand Lassalle, the leader of the Prussian Socialist movement. Kalischer saw the ingathering of Zion and ending Jewish exile as the fulfillment of the messianic prophecy. Unlike other proponents of Orthodoxy, Kalischer believed that the arrival of the Messiah would be accelerated if Jews were to settle the land of Israel. He contacted the prominent banker Mayer Amschel Rothschild in 1836 to buy land in Palestine and helped to establish the Berlin Central Committee for Jewish Colonization in Palestine in 1864. In his magnum opus Rome and Jerusalem, published in 1864, Hess advanced the idea of establishing a Jewish state based on Socialist principles where Jews would till the soil as farmers. The term “Zionism” was coined by the Austrian author and journalist Nathan Birnbaum as early as 1890. Birnbaum founded the Jewish Kadimah fraternity and became the editor of the periodical Selbstemanzipation (Self-Emancipation) which was published between 1885 and 1894. Among the early pre-Zionist travelers to the yeshuv in Palestine were Ludwig August Frankl (1810 – 1894), a journalist and archivist of the Vienna Jewish Community. In 1856 Frankl traveled to Jerusalem to open the Lämel School, the first progressive school in the region to teach secular subjects. Bitterly opposed to educational innovations, the Orthodox Ashkenazi Rabbinate of Jerusalem excommunicated Frankl. However, the herem (ban) failed to impress the Sephardic community, who sent their children to the school in great numbers. Another traveler to the Middle East was Arnold Mendelssohn, one of Moses Mendelssohn’s grandsons. The younger baptized Mendelssohn settled in Jerusalem as a physician and there founded the Catholic St. Ludwig Hospital. His correspondence with his father Nathan in Germany gives a vivid picture of conditions in Palestine in the pre-Zionist era. Theodor Herzl lived in Paris as the correspondent for the Viennese newspaper Die Neue Freie Presse (The New Free Press) when Captain Alfred Dreyfus was tried in France for alleged espionage. Dreyfus’ conviction as well as the open anti-Semitic propaganda Herzl encountered in Paris and under Viennese Mayor Karl Lueger dramatically changed his outlook on Jewish assimilation and led him to champion the idea of an independent Jewish homeland. 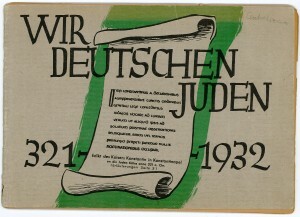 This pamphlet was published by the Centralverein, a leading national Jewish organization. 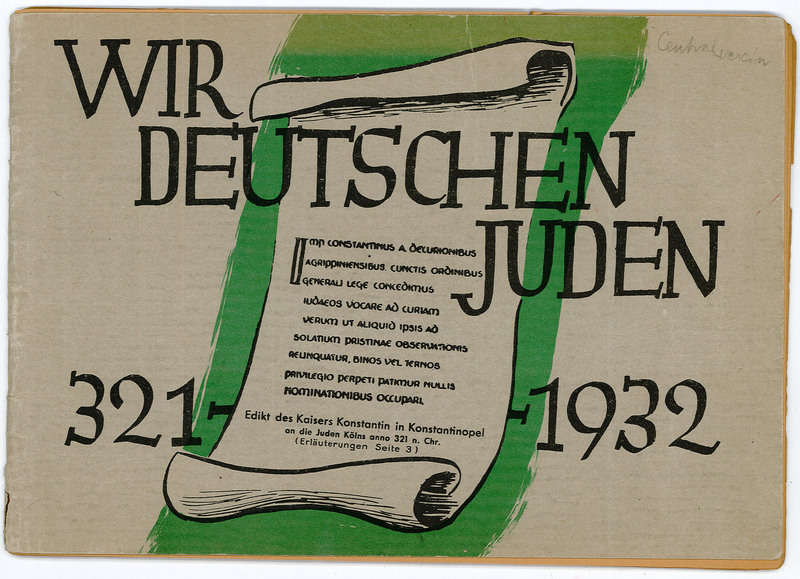 It enumerates the contributions of Jews to German culture and is typical of the mainstream German-Jewish response to anti-Semitism, which rejected Zionism in favor of the argument that Germany was the long-established homeland of its Jews. The evolving program of the Zionist Congress highlights the problems the movement faced, including opposition to Zionism by most established Jewish organizations and the majority of Western European Jews. Discussions focused on the attitude of public political figures toward Zionism, like German Emperor Wilhelm II, who met with Herzl in Constantinople and Jerusalem in 1899. The centrality of culture in the building of a new Jewish state was one of the main themes of the Fifth Zionist Congress, where Martin Buber led a group of intellectuals— including Chaim Weitzman and Leo Motzkin—in demanding a stronger emphasis on establishing a Hebrew culture and adopting greater democracy within the organization. This meeting of 1901 also saw the establishment of the Jewish National Fund which propelled the movement closer to its practical goals. Herzl’s closest ally and co-founder of the Zionist movement, Max Nordau, was a physician, cultural critic, and author. He championed the idea of “muscular Judaism” to nurture a new generation of physically fi t Jews as opposed to what he perceived as “weak” Jews of the ghetto. Another early Zionist was Max Bodenheimer, a lawyer by training and one of the co-founders of the Jewish National Fund. Like many Zionists, Bodenheimer was horrified by the frequency of pogroms in Eastern Europe, which motivated him and others to create aid programs in support of East-European Jews in the Pale of Settlement during World War I. 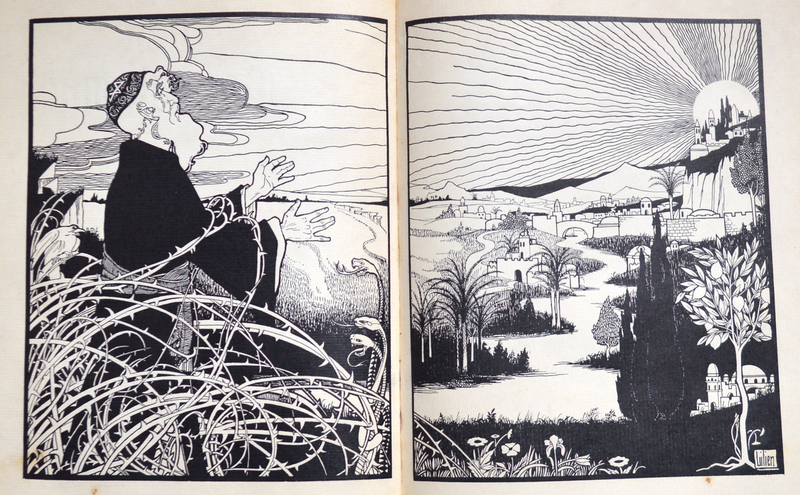 The painter and printmaker Hermann Struck visited Palestine as early as 1903 and emigrated to Palestine in 1922, settling in Haifa. Struck, an Orthodox Jew, was also a member of the religious Zionist Mizrachi Movement and served as its delegate at several sessions of the Zionist Congress. Contact with Eastern European Jews during WWI contributed to strengthening support for the Zionist movement among German-speaking Jews. Two of its leading representatives were Prague journalist Robert Weltsch and German philosopher Martin Buber. Robert Weltsch was the editor of the Jüdische Rundschau (Jewish Panorama) from 1902 until 1938. The Zionist movement in Germany and Austria grew dramatically after World War I on account of its active and flourishing Blau-Weiss (Blue-White) Youth Movement. 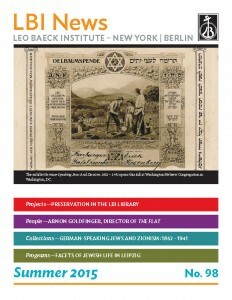 Blau-Weiss organized camping trips and other nature outings to instill an appreciation for the outdoors and physical fitness in young Jews as an antidote to the perceived spiritual and physical decadence of traditional Jewish living conditions in Europe. 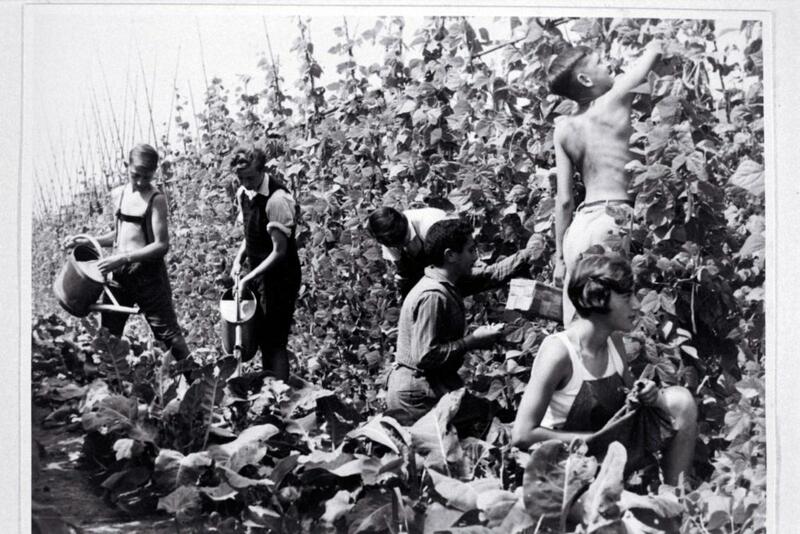 A group of youth working on an agricultural training farm in the 1930s. 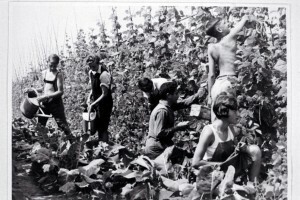 After the Nazis came to power in 1933, the Zionist Halutz (Pioneer) Youth Movement expanded its eff orts to reach out to young Jews and facilitate their emigration by establishing agricultural training camps. 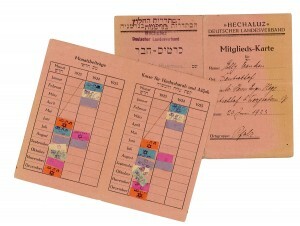 Approximately eighty training centers throughout Germany were in operation during the 1930s teaching crafts and housekeeping in addition to agriculture. Each year, about 2,000 young Jews graduated from these training facilities hoping to settle in Palestine. However, many of the graduates of these hachshara (preparation) programs ended up emigrating to other countries because the demand for settling in Palestine by far exceeded the immigration quotas set by the British. This exhibit is made possible by support from the German Information Center, USA.